When a rubber band is stretched out, there are not as many ways the individual molecules can arrange themselves as they are when the rubber band is not stretched. They have to be lined up. These links between the chains are called cross links. If too much force is applied these cross links will break and the rubber band will snap. When there are more ways to arrange the molecules, the entropy is higher. When a rubber band is stretched, entropy dictates that the rubber band will want to contract again. When the temperature is higher, the molecules are more excited, and want even more to be in a random state. This makes the rubber band easier to stretch out. At a constant temperature, a rubber band obeys Hooke's Law: The force, f = - K(X - Xo) where K is a constant, (X - Xo) is the elongation and the sign in negative because the force is in the direction opposite to the extension. That is the force, f, is trying to pull the rubber band back to its equilibrium length, Xo. The purpose of this investigation is to discover the effect of changes in temperature on the elasticity of a rubber band. We believe that the elasticity of the rubber band is going to increase as the temperature increases in our experiment. Elasticity of the rubber band is defined as the maximum length the rubber band stretches from its initial length when weight is placed on it. (Dependent Variable) Temperature is defined as the temperature of the water that the rubber band is submerged in (Independent Variable). The type and size of rubber band and time of rubber band submerged in water will be controlled. Our first action was to create a contraption which would allow us to determine the elasticity of rubber bands, while varying both the temperature of the rubber bands and the amount of weight placed on them. See picture below. Using nails, we fastened the three pieces of wood together into a frame with a hole in the top and two pulleys attached, allowing a wire to travel through the hole in the top of the contraption, then partway down one side of the frame. To the top of the contraption, we fastened a metal strip that extended downward from the middle of the apparatus, next to the wire. At one end of the wire we placed a 50 g hook to hold the weights, and on the other end was a small metal clip, where we attached a rubber band. The rubber band was anchored to a small metal hook that was attached to the metal strip. We fastened a ruler to the side of the frame by the weight, in order to measure how much the rubber band stretched. After the contraption was built, we decided to create different water temperatures in order to change the temperature of the rubber band. We put water in a large class container, then cooled it with ice cubes to get our first temperature of 0 degrees Celsius. 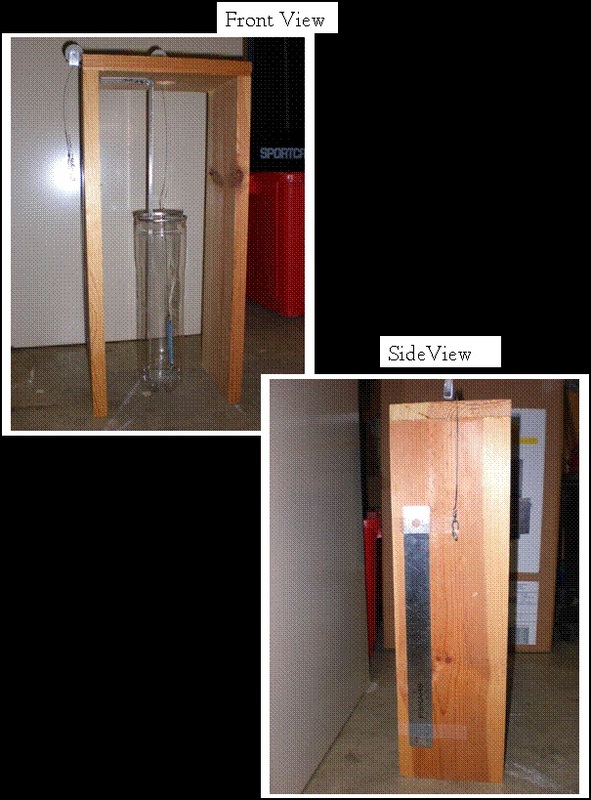 We placed the glass container inside the wood frame, submerging the rubber band. Then, we measured the amount the rubber band stretched after adding weight to the 50 g weight hook. We calculated the elasticity of the rubber band at 100, 200, 300, 400, 500, and 600 g. We repeated this procedure for temperatures of 20, 40, 60, 80, and 100 degrees Celsius, using the hot plate to bring the water to warmer temperatures. After collecting data on each new temperature, we switched rubber bands, to minimize error. The hypothesis was supported by our experiment. 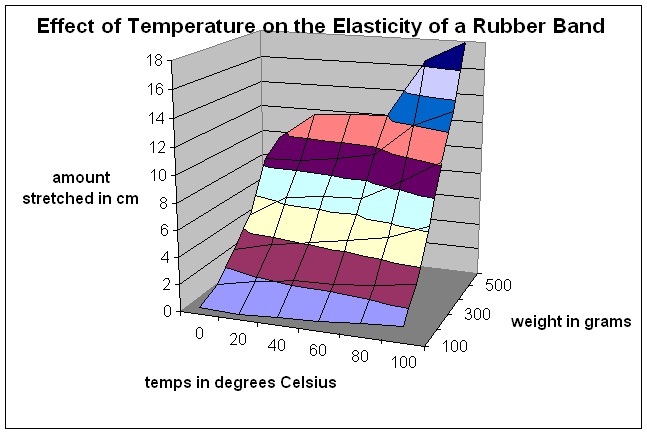 The heated rubber bands were the most elastic; stretching to the farthest extends of 17.90 +/- o.o5 cm (100 C). The rubber bands in freezing water were the opposite, with a stretching length of 9.50 +/- o.o5 cm (0 C). The results were consistent, providing a reliable conclusion to the project. Thermal expansion caused the rubber bands to react as they did. When the rubber bands were heated, the particles stretched out, making them more elastic and able to withstand greater force. When frozen, the particles contracted, adding strength and increasing resistance to force. Our results also showed that the effect temperature had on the elasticity of the rubber bands was amplified under more weight. At lower temperatures the difference between light and heavy weights was significantly less than the difference between the same amounts of weight at higher temperatures. Some of the sources of error were the initial elasticity of the rubber bands. After a rubber band was tested at a certain temperature, it could no longer be used. Therefore, we had to use different rubber bands every time. To reduce this error we made sure that all of the rubber bands had the same initial stretch; however, there is still possible error. Another source of error would be the temperature of the water and rubber band. It was harder to maintain the same temperature for a period of time. The temperature could have fluctuated during our experiment, varying out results. If we were to conduct this research again, we would not control the amount of weight used to stretch the rubber bands. Next time, we could make the model so that the temperature could be consistent throughout the measurement process. Also, we would use as much weights as it takes for the rubber band to snap. 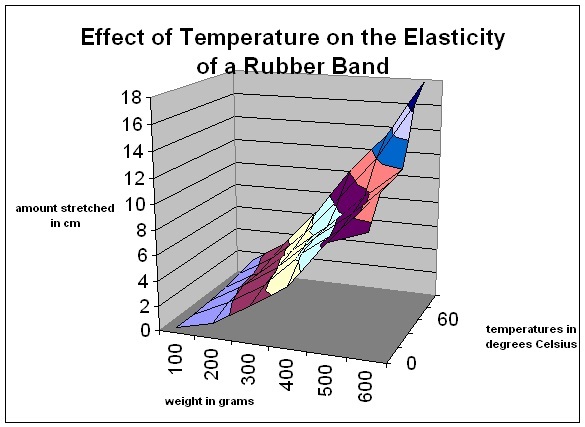 We might try to use different types of rubber bands in more temperature values as well. 1. "Elasticity (physics) -- Britannica Online Encyclopedia." Encyclopedia - Britannica Online Encyclopedia. Web. 30 Oct. 2009. <http://www.britannica.com/EBchecked/topic/182035/elasticity>. This website is about elasticity, and was useful in finding simple definitions for our project. 2. Giancoli, Douglas C. Physics Principles with Applications (6th Edition). Upper Saddle River: Prentice Hall, 1998. Print. 3. "How rubber band is made - Background, Raw Materials, The Manufacturing Process of rubber band, Quality Control, The Future." How Products Are Made. Web. 30 Oct. 2009. <http://www.madehow.com/Volume-1/Rubber-Band.html>. This source talks about how rubber bands are formed, and their structure, which was useful in helping us to predict what would happen to the rubber bands when stretched. 4. "Mad Physics :: Hysteresis and Rubber Bands." Mad Physics :: Fun Experiments and More. Web. 30 Oct. 2009. <http://www.madphysics.com/exp/hysteresis_and_rubber_bands.htm>. This website is about hysteresis in rubber bands. It details a similar experiment to the one we did. 5. "Physics tutorial: Hooke's Law." Physics Homework Help, Physics Help, Physics Tutors. Web. 30 Oct. 2009. <http://www.physics247.com/physics-tutorial/hookes-law.shtml>. This source is about Hooke's Law, and how it can be applied to rubber bands.